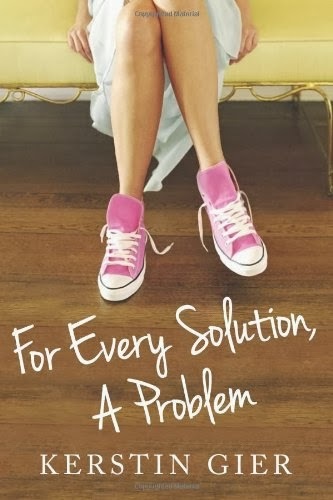 For Every Solution, a Problem is a book by Kerstin Gier. This a very entertaining book. The protagonist is Gerri, a 30+ single, German girl who writes trashy-romance novels. Her family, specially her mother has no respect for her career choice, and cannot deal with the fact that she is single. Gerri is depressed, and decides to commit suicide. As a going away present she writes each one of her relatives a letter stating what she really thinks of each one of them... Gerri mails those letters, prepares her night to go ahead with her plans, goes to bed and... The following morning she is not dead. She is alive, and her family members are getting ready to read all the letters. I read this book in one afternoon. The writing is extremely humorous, entertaining and witty. The situations real and very funny. I would never think that addressing the issue of committing suicide could be achieved in such a talented way. The idea of writing the letters was absolutely superb, the honestly of the letters totally refreshing. I love the fact that it has a happy ending. It is a must in The Happy and Enjoyable Collection in my Kindle.